You've heard me talk about some of the things that shock an American here in France, but I don't feel you'll ever understand the extent of it until your child's teacher sends you a photo of your 12-year old daughter holding a bottle of beer in school and pretending to be drunk with her friends -- and the teacher sends it as a sign of approval, with high marks. Here then is part one of a series of postings I'm calling "Unsafe, Uninsured, Unconcerned, and Politically Incorrect." 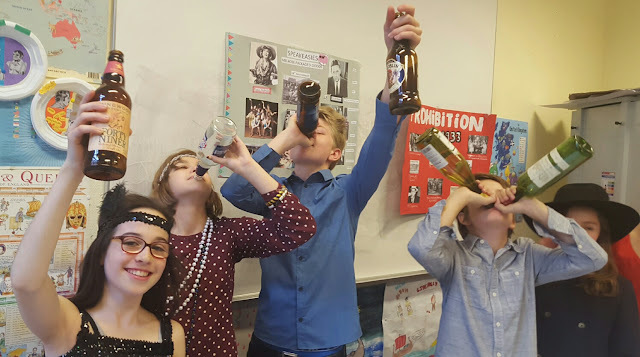 When I comment to the teacher that this presentation skit on Speakeasies in the 1920s, with fake drunkenness, real liquor bottles, and a realistic-looking pistol on school grounds, would never be allowed in American schools, she cheerily responds, "One of the American SAT teachers nearly had a heart attack when she saw the bottles through the class window. I just waved at her." God bless the ability to be political incorrect, on occasion, harmlessly (you see how I qualified that? How American I am? I'm afraid to be politically incorrect about how good it feels to be politically incorrect. I want you to know that no feelings were hurt in the production of this blog posting). At the school's Quiz Night, one of the high school students wins a raffle prize of a bottle of Jameson. By coincidence, it is an American handing out the prizes, and he instinctively asks how old she is (18) and, simultaneously, announces, "No photos!" The American in me is afraid of the liability, so school, girl, and raffle-prize giver shall all remain nameless. The only name you'll get out of me is the brand of whiskey. But I don't know why he is worried handing the prize, or why I'm worried talking about it. Another friend of mine who chaperones a prom at a different bilingual school's American-style junior and senior prom tells me that the prom officially serves wine and champagne to the students. After all, the older high school students are probably mostly of legal drinking age here. Or not. Honestly, nobody really knows what the minimum drinking age is. You may find it unsafe and politically incorrect, but the schools are unconcerned (and probably uninsured against alcohol, to boot). Cheers! Persillé du Beaujolais is a raw cows' milk blue cheese made at the Fromagerie Mons in the Saone et Loire, which is not normally blue cheese territory (Roquefort is clear on the other side of the country). But it's a delicious blue, streaked -- or "parsleyed" as the name means literally -- with some delicious mold. It's a thick, pretty classic-tasting blue, but not as pungent or tangy as a Roquefort. It's a medium-strength, almost mellow blue, with plenty of sweet, nutty notes. The crust is thick and daunting, and I'll look the other way if you want to cut it off before eating your cheese. I'll eat it, because that's the sort of dedicated cheese-eater I am. The way I see it, if you're scared of the crust, you probably won't be happy eating that much mold, either. This cheese, Persillé du Beaujolais, is made in Beaujolais, which is of course the town famous for churning out Beaujolais Nouveau, the young red wine released so festively each year. So, young wine for a story about youngsters and wine. Plus, as an unpasteurized blue, the cheese itself would probably be considered unsafe and uninsurable at many American tables.